And so it ended just as it had begun with a cacophony of sound emanating from the Olympic Stadium, the cauldron of dreams. A light fest to brighten up the London sky to announce ‘we did it!’. Although the closing ceremony didn’t have anywhere near the impact of Danny Boyle’s opener -and lets be honest, not many people expected it to, the creative details that went into putting the both ceremonies and the main sporting event was awe-inspiring. From the 70,500 digital tablets next to each seat that were used to display everything from spectrum analysers to that infamous tweet from ‘Father of the Web’ -Tim Berners-Lee, to the rivers of molten steel to form the olympic rings, the creativity was all apparent. And what of the dancers and performers? According to Quora there were 7,500 dancers, actors and musicians involved who put in 150 hours of rehearsal time! The dedication was overwhelming with some people taking a lot of time off work, travelling hundreds of miles and some people even giving up their jobs for this ‘once in a lifetime’ experience. And I think I can safetly say it showed. And then the branding. Ok, so nothing has changed my mind about the logo. I still think its awful and i’m not the only one, -although distinctive, which is a quality many brands aspire to but never realise. This distinctiveness flowed through the venues, the local signage and the tube stations. 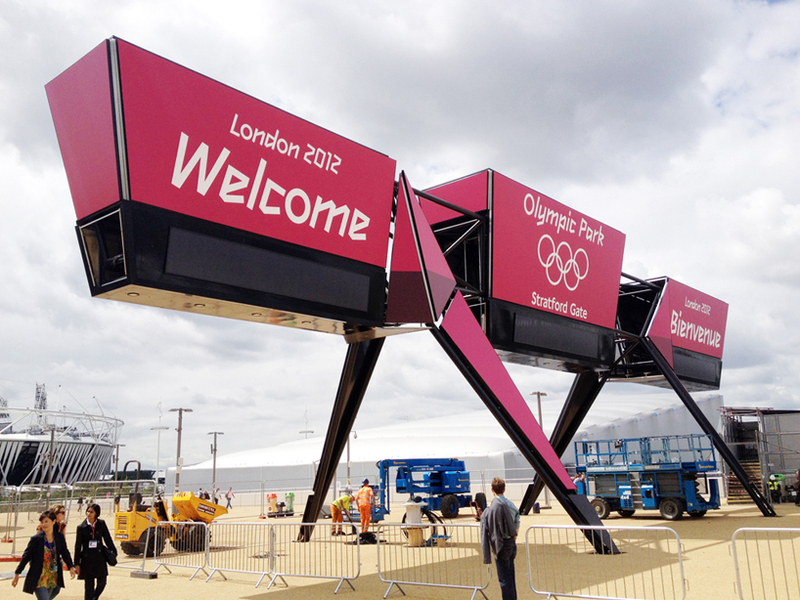 The typeface, designed specifically for London 2012 again worked well across many areas. I know some people were less than complimentary, the font even being included in the top 8 worst fonts in the world, but I feel it was strong when used in the right places. Can you imagine being in the meeting discussing the colour themes and hearing someone perk up and suggest pink as the main colour? Well, whoever did that, it worked. Again, the word ‘distinctive’ pops up as the best way to describe it. Its not something you forget easily. Watching the hockey or basketball and handball the pink can be seen clearly to align the stadium with the brand. Very effective and works across varying media. It would be interesting -but probably nigh on impossible, to add up all the creative hours that went into producing London 2012. There are some things in the creative world that are much harder to quantify than others. I haven’t even mentioned music and the very chic Team GB kit designed by Stella McCartney. Overall creatives made a dynamic impact across the games. But as we have one of the best creative industries in the world, I guess that shouldn’t be too surprising.